"Bajajs have always been orange," Ibu Ani says, slack-breasted in a yellow singlet. "The government wants them orange." We're in a small yard ringed by slapshack houses, near the Karet Bivak cemetery in Karet Tengsin, central Jakarta. In the centre of the yard are 12 parked bajajs. One has been stripped and is being re-sprayed pumpkin orange. Bajajs are a bit like hollow pumpkins on three wheels. "What would happen if you painted the bajaj purple?" "There would be a problem with the police." 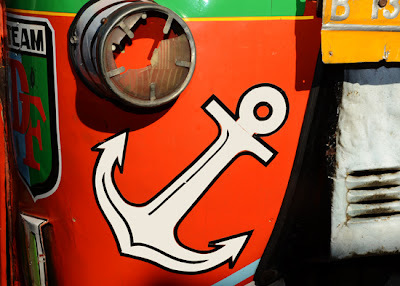 The yard has been used as a bajaj maintenance workshop for five years. 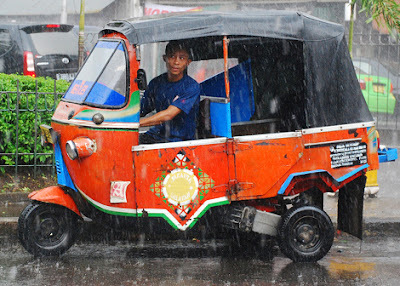 "It costs over Rp 1 million ($100.00) to repaint a bajaj," Ibu Ani says. "Two million," someone else calls out. "The owner pays, not the driver," Ibu Ani clarifies. The owner of these particular bajajs owns 30 vehicles in total. 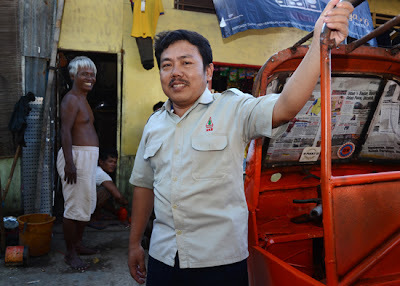 The drivers pay the owner Rp 42,000 ($4.20) a day and keep for themselves anything extra they make from driving passengers short distances around the city. On one side of the yard is a bare wall with a crude aperture through which a young woman sells sachets of Rinso washing detergent, cigarettes, envelopes and peanuts. 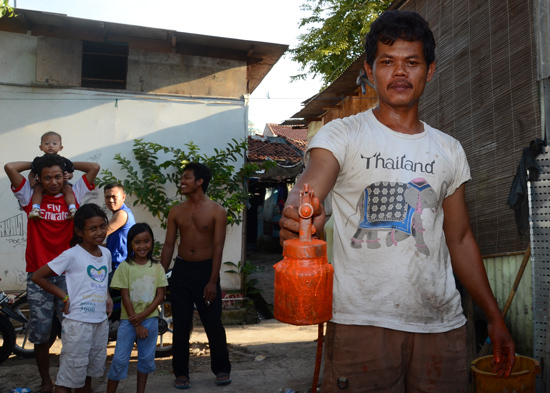 "That's the bajaj owner," says Ibu Ani, pointing to the woman in the recess. "She's called Erlena." Erlena doesn't smile. The man re-spraying the bajaj is Ari. He fills a spray can with paint, attaches it to a hose and a generator and blasts the paint on the bodywork. Later the driver will tell Ari what motifs and designs he would like on the chassis. "Ari's an engineer and an artist," someone pipes up from the gathering crowd. "He can do silhouettes." "Some have special words painted across them: like Princess or Destiny." 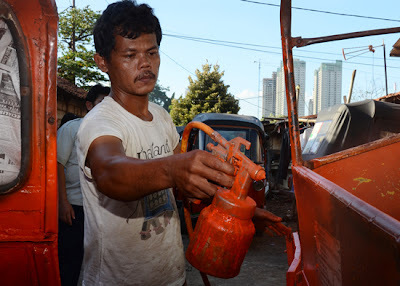 "But the government wants to get rid of the orange bajajs," continues Ibu Ani. "They want to replace them with the blue BBG ones." The crowd looks askance. Bahan bakar gas (BBG) is compressed natural gas; BBG bajajs are quieter, more environmentally-friendly, and much more expensive. 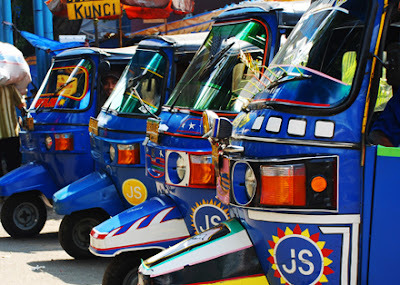 "Drivers have to pay the owners Rp 130,000 ($13.00) a day for the blue bajajs." "Hey! ", a pot-bellied man waddles into the yard. He has the nose of a gnome. "What's that?" he asks me bluntly, pointing to the bajaj. "Hmff. She knows!" he remarks to the others. The test is over. He gestures to a plastic stool and invites me to sit.